Defence Industry Minister Christopher Pyne launches Lockheed Martin Australia’s STELaRLab, watched on via video link by Ambassador to Washington Joe Hockey and Lockheed Martin chief executive Marilyn Hewson. Australia spends around $1 billion a year surveying powerlines by helicopter, a job that could be done for a faction of that price by new autonomous unmanned aerial vehicles (UAVs) able to top up their batteries from the powerlines themselves. 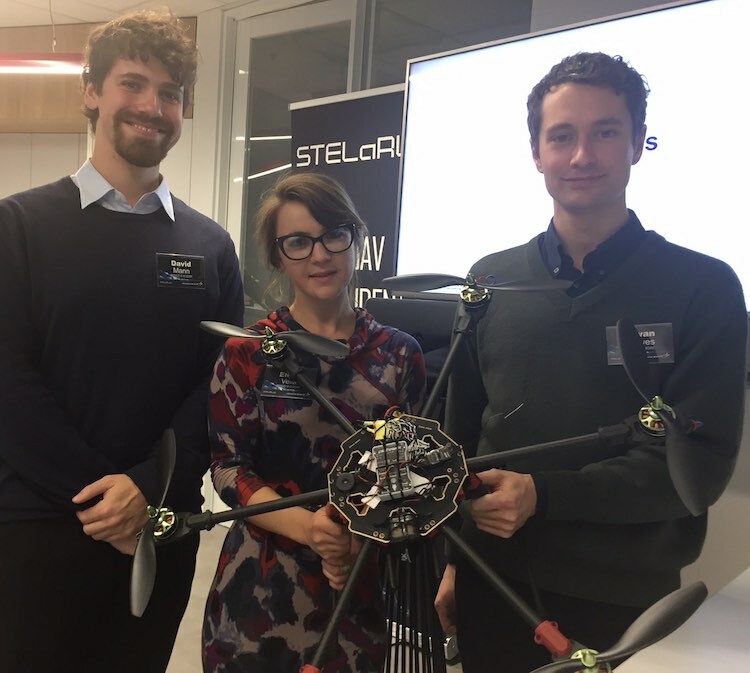 Engineering students from Melbourne University, backed by Lockheed Martin’s new STELaRLab advanced research centre, have developed innovative technology to allow a UAV (or drone) to grab hold of the powerline and use an induction loop to charge its batteries. That means the UAV could operate autonomously for days on end, surveying lines for faults or weak spots and recharging whenever needed. This was shown off to Defence Industry Minister Christopher Pyne who officially opened the STELaRLab facilities in Melbourne on Wednesday. The Minister was suitably impressed. “That is really exciting,” he said. STELaRLab was launched a year ago with an investment of $13 million as the Australian outpost of Lockheed Martin’s broader US research network. Pyne said this was a collaboration between Lockheed Martin, Defence and the University of Melbourne to produce world-leading research and development. He said Lockheed Martin understood Australia’s need to develop sovereign defence capability. “That will make Australia a better ally to the US, more able to defend our nation and its people, more capable of projecting our power in the region and being a regional power that is standing up for the values that our countries . . . believe in,” Pyne said. As well as the powerline UAV, current research work includes hypersonics and a complex command and control system for a proposed integrated air and missile defence system. 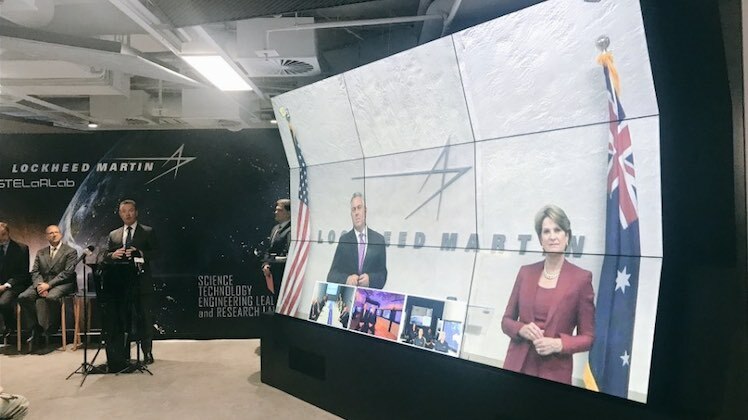 In a video link from the US, Lockheed Martin chief executive Marilyn Hewson, flanked by Ambassador to Washington Joe Hockey, said the lab had already produced impressive results. “What the STELaRLab does is bring together the finest minds in Australia with the Australian academic institutions to work on thoser very important technological advances,” Hewson said. The autonomous UAV idea was the final year project of engineering students Elena Vella alongside fellow students David Mann and Rowan Skewes. “We approached our supervisor and he was working in collaboration with Lockheed Martin. The lab approached us with a list of problems,” Vella said. Engineering students David Mann, Elena Vella and Rowan Skewes have developed a drone able to recharge its batteries from powerlines via an induction loop. For “power harvesting” there were a number of possibilities including solar and wind but they settled on use of the inductive coupling. After all the power lines carry plenty of power – it’s just a matter of getting to it. “It just seems crazy not to harvest that power,” she said. They have proved this can deliver viable power, enough to fully recharge batteries in around six hours. Plenty more work will be needed but the potential appears to extend far beyond Australia’s powerlines. To coincide with Wednesday’s launch Lockheed Martin has published a YouTube video further explaining the work of STELaRLab. Great initiative and tremendous to see Elena in there contributing with her male engineering colleagues! More automation! more people out of work! Yay!